On this day in history, 25th October 1532, King Henry VIII arrived back in the English territory of Calais following his visit to the French court at Boulogne. Francis I, King of France, travelled back with him. There was no sign, however, of Henry VIII’s sweetheart, the woman who had accompanied him on his journey from England to Calais, Anne Boleyn. On his arrival in Calais, Francis I sent the Provost of Paris to Anne Boleyn with a gift, “a diamond worth 15,000 or 16,000 cr.”, but still Anne didn’t appear. Anne was biding her time, she was going to make a dramatic entrance on 27th October 1532, at the special banquet held by Henry VIII in Francis I’s honour. You can click here to view a timeline of the couple’s trip to Calais in October 1532, with links to articles on it. 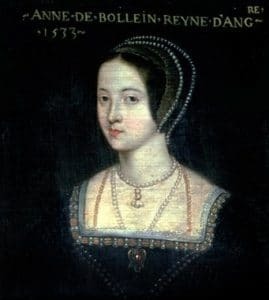 Picture: Anne Boleyn, French School. ed. Goldsmid, Edmund (1884) The Maner of the tryumphe of Caleys and Bulleyn and The noble tryumphaunt coronacyon of Quene Anne, wyfe unto the most noble kynge Henry VIII, Printed by Wynkyn de Worde, 1532-33, p.12-13. Hall, Edward (1809) Hall’s chronicle: containing the history of England, during the reign of Henry the Fourth, and the succeeding monarchs, to the end of the reign of Henry the Eighth, in which are particularly described the manners and customs of those periods. Carefully collated with the editions of 1548 and 1550, p792-793. Letters and Papers, Foreign and Domestic, Henry VIII, Volume V, 1485. I would think that this would have pleased Henry as it showed that his marriage was accepted by the King of France. I wonder what eventually happened to that stone? I have read that Elizabeth may have been in possession and may have even worn one of the 3 drop pearls from her mother’s “B” necklace. Did she inherit many of her mom’s possessions or did most everything revert to the crown? BTW- Claire has done a guest show on ‘The History of England’ podcast dealing with the fall of Anne Boleyn. It was released a few hours ago. Amendment. I didn’t mean to say marriage. This is too soon so replace with ‘acceptance of new significant other’ as I am not sure how she would have been introduced. Wow what a gem! Anne was going to make a dramatic entrance alright, as the entertainment, along with several other dancers wearing masks. Francis may have given the impression that he supported the future marriage of Anne and Henry, but his wife and sister refused to receive her. Francis was Henry’s guest here, but when he went to the French side to be the guest of Francis, Anne was left behind. Still it was tacit recognition of her as Henry’s future consort. It was later clear that Francis was unable to formally back his marriage as he had not waited for the Pope. He sent wedding presents but he backed off actually aiding Henry and he could only wish Anne well via her father. As a lover of jewelry and Anne Boleyn I find this so fascinating!. No doubt the diamond was fabulous! I only wish I know more about he diamond it’s self. I wonder what shape it was and how it was faceted. Back in those days they did not have the technology and know how,that we do today,in regards to gem faceting. What they did have was a style of rose cut. And they had table cut:a primitive predecessor of what we have today..hmmm. It must have been an exciting and wonderful trip for Anne, to her beloved France,despite of the slight from the queen of France with her refusal to meet her (Anne). But you know what? I think the way she did enter was so much more exciting and memorable,than the protocal of just meeting and introducing wtih the french queen. It is just so like Anne Boleyn, when she realizes one way is not going to work she finds another way. And talk about doing it in style!- Cleverly and concisely putting together a beautiful dance with exotic costumes with her ladies to make her entrance! What a fascinating lady was Anne Boleyn! Correction,the rose cut was not invented until,the mid 16th century, The point cut was what they had,not rose cut. The ‘table cut’ was and a cut called ‘old eight cut’ were derived from the point cut,both were around at the time of Anne Boleyn’s trip to France. Also, there was diamond that would have hung free of any setting,it was a pear shaped daimond created in 1476,called ‘briolette’.